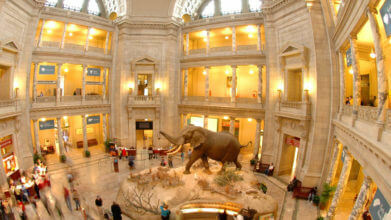 The institution has the largest single collection of African art in the United States. The museum traces its roots back to the 1950s when Warren Robbins, a Foreign Service Officer, began collecting African masks, figures and textiles. As his collection grew, he purchased a house in Washington’s Capitol Hill neighborhood and opened it as a small museum. It later expanded to over a dozen buildings, including one that once served as the residence of abolitionist Frederick Douglass. The museum was formalized in 1964 as the Museum of African Art. During the 1970s, Robbins lobbied Congress to have the Smithsonian assume responsibility for the museum to preserve the collection long term. The measure was approved in 1978 and the institution was officially renamed the National Museum of African Art three years later. Almost immediately, the Smithsonian began the process of relocating the collection from the various townhouses situated across the Capitol Hill neighborhood to a more suitable museum. Construction of the museum building located on the National Mall began in 1983. Like the nearby Sackler Gallery, the majority of the museum’s 368,000 square feet of exhibition space is situated mostly underground. The project’s lead architect was Jean-Paul Carlhian. The Museum of African Art has one level above ground featuring a red granite façade, a limestone foyer and circles as its architectural theme. This contrasts with the triangle and pyramid shapes of the Sackler Gallery. Galleries and event space occupy three lower levels that are connected by an enclosed arcade boasting several skylights that provide natural illumination. Ongoing exhibitions include the wind, water and healing arts series. The wind exhibits include a cross section of the continent’s history, culture, politics and trade. The water exhibits highlight the way that this vital resource flows through the continent and connects people of different cultures. The healing arts exhibits feature works highlighting Africa’s physical, social and spiritual challenges. Another permanent exhibit showcases the vibrant colors and intricate details of African mosaics. The museum also houses the unique and rare works of the famed Walt Disney-Tishman Collection of traditional Sub-Saharan art. In addition to its permanent, special and rotating exhibits, the museum also sponsors educational outreach programs, public discussions, films, workshops, storytelling sessions and musical performances. The National Museum of African Art is open to the public free of charge from 10 a.m. until 5:30 p.m. every day except Christmas. Docent-led walking tours are available throughout the week. Sign language tours can be arranged in advance. The museum also offers assisted listening devices when needed. Exhibition materials are available in large print, audio cassette and computer disc formats. Tours begin at the Information Desk located in the ground floor pavilion. The wheelchair accessible museum has on-site restrooms, a retail shop and changing rooms. The closest food court is situated in the nearby Smithsonian Castle. Heightened security measures, which include the search of backpacks and other large bags, can increase the time it requires to enter the museum. There are a limited number of metered parking spaces near the museum on Independence Avenue. Designated handicapped accessible parking spaces can be found on Jefferson Drive. The Smithsonian Metro stops on the Orange and Blue lines are approximately one block away. The most convenient way to reach the National Museum of African Art is to ride the Old Town Trolley. Climb aboard the trolley and hear a fascinating and educational narrative about many of the city’s famous monuments, memorials and other points of interest. Hop off the green and orange trolley at the museum and explore it at your leisure. When you have finished, climb aboard the next passing trolley to continue the fun-filled sightseeing tour where you left off. One comes by every 30 minutes. Old Town Trolley eliminates the hassles of navigating congested city traffic and trying to find a place to park. The Freer Gallery of Art features a wide collection of Asian, Near East and Egyptian works from antiquity to contemporary times. The museum’s highlight is the Peacock Room designed by famed American artist James McNeil Whistler. Featuring Anglo-Japanese designs, it is considered a masterpiece in interior decorative art. Built in 1855, the Smithsonian Institution Building is a National Historic Landmark designed by James Renwick, Jr. The red Seneca sandstone building is colloquially known as the Castle because of its faux Norman architectural façade. The Castle houses the Smithsonian Information Center and exhibits that highlight the collections in each of the Institution’s other museums. Situated in front of the Smithsonian Arts and Industries Building, the Carousel on the National Mall was built in 1947. The historic carousel played a role in desegregating Maryland’s Gwynn Oak Amusement Park the same day that Dr. Martin Luther King gave his famous “I Have a Dream Speech” during the historic March on Washington. It replaced the original mall carousel in 1981. Featuring 60 jumping horses and sea dragons, it provides fun and excitement for children of all ages.